Colors have always borne symbolic and emotive meaning, whether in art, religion, politics or culture. Black signifies death, white signifies innocence, red signifies passion, blue signifies calm. But these are just a rudimentary skin, beneath which lie complex and constantly shifting threads of significance in an ongoing negotiation of power. In Malaysia today, the color yellow has gained notoriety. It has inspired hope, mobilized connectedness, instigated arrests and aroused fears. Yellow is the color of the Bersih coalition, a campaign for free and fair elections that in November 2007 inspired a historic march of more than 20,000 people in Kuala Lumpur. On July 9, 2011, there will be another walk by yellow-clad supporters. Plans for this event have resulted in a salvo of reactions and counter-reactions by supporters and opponents alike, including a wave of artwork, poetry and designs that suture new meaning onto yellow. Schoolchildren here are taught that yellow in the Malaysian flag signifies the country’s royalty. The yellow crescent moon and star in a field of blue achieves symbolic weight through its connection to Islam, Malaysia’s official religion, and though its proximity to the red and white stripes representing the 14 entities that make up the Malaysian federation. A sign of our journey toward independence and autonomy from British rule, the colors and symbols evolved from long negotiations that were part of a democratic process. In 1947, the Federal Legislative Council organized a design competition for a new flag and submitted a shortlisted group of proposals to the public, which voted on them by mail. Mohamed Hamzah, a 29-year-old architect, surmounted a field of 373 entries to win that competition. The current tide of yellow resonates with this history of transformation. Tired of flawed democratic processes, Bersih, which means “clean” in Malay, is calling for the return of real power to ordinary citizens through fair elections. Yellow now signifies the power of the people. This can be seen from the creative expressions shown here. Shieko Reto, poster representing efforts to sanitize Malaysia's electoral process spearheaded by Bersih (Malay for "clean"). Shieko Reto’s work depicts an ordinary citizen literally cleaning up the nation. Here, blue, which in the language of the Malaysian flag signifies unity of the people, instead stands for state power (represented in daily life by the blue policeman’s uniform). Sharon Chin’s posters announcing the July 9th march offer metaphors for citizen engagement in the political process, from dancing to musical harmony. In her work, she coopts the significance of blue by also turning yellow into the color of unity. Bersih’s opponents make equal attempts to claim and redefine yellow. The anonymously designed “kotor” (dirty) icon undermines the association of yellow with clean democratic systems, turning it instead into a symbol of corruption and moral decay. This symbol gains currency through mimicry — with notable variations. The ballot’s check symbol, which signifies popular power, is replaced with a red keris, the dagger that is a symbol of Malay supremacy. Race relations are thus brought into the conversation, augmented by the color red, which alludes to violence or danger, and is a reminder of bloodshed that has taken place (or has been repeatedly warned as an ever-present potential) in the nation’s history. The calls for change in the distribution of social and political power is clearly accompanied by the disruption and subversion of symbolic meanings attached to our national colors. Even visual and poetic commentaries have an anarchic and mimetic spontaneity, gathering strength and vitality with each new interpretation and creation. This in itself represents the energy, power shifts and longings of what constitutes a “nation” at this time. So what does the color yellow now signify? The prevalence of meanings will depend on how they resonate with, stick to or are adapted by the people. In other words, the meanings that prevail will depend on how many choose to reify, subvert or reinforce particular symbols and expressions. Funnily enough, it’s a form of democracy in its own right. This essay was adapted from Jac sm Kee, "Yellow Is the Colour Of...," originally posted on Malaysia Design Archive. Yellow also encourages communication and it activates memory. And the interesting information about this color is that, it is the happiest color in the spectrum and a yellow flag indicates quarantine. In the flag of Malaysia,I think the yellow crescent symbolizes Islam religion. 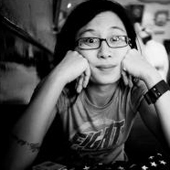 Jac sm Kee is is a feminist writer, activist, poet and occasional painter. She has written column pieces for several Malaysian newspapers, and numerous articles for both online and offline journals.